This is a clear indication that you need to have your brake’s inspected. Your vehicle is programmed to alert you if your brake hydraulic system is experiencing issues. If the light comes on and off, you might just have a low level of brake fluid. 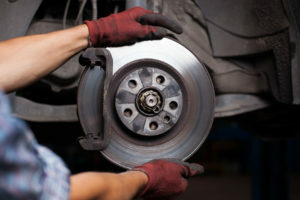 Hearing noises when you hit the brakes can be a sign that your brake pads need to be replaced. Usually the sound is a high-pitch squeaking noise. Sometimes a vehicle can coast to one side while driving. This is commonly because a vehicle needs an alignment. But if it pulls to one side as you apply the brakes, this is often an indication of brake issues and should be checked by a mechanic. When a brake pedal nearly hits the floor or a lot of pressure is needed before the brakes engage, you should immediately have your brakes inspected. If you find yourself in a situation where your vehicle is not braking, you can use your emergency brake to help stop the vehicle. The main reason you’ll feel vibrations is because your vehicle is either having brake pad issues or brake disc issues (rotors). Brake pads get exposed to dirt and oil, which can cause vibrations. When your brake pads have been bad for a while, meaning they are warped or damaged, you will most likely discover issues with your rotors from “metal on metal” contact. The way that you drive and the conditions you operate your car in are factors that affect your brakes. You can also opt for better quality brake pads. You can research the 3 types of brake pads (organic, metallic and ceramic) and which would be best for your vehicle.